Sheffield is the home to the Crucible Theatre (0114 276 9922), where there is also the Studio Theatre within the building. The annual Snooker World Championships are held at the Crucible. 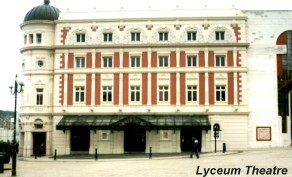 Other theatres include the Lyceum (0114 276 0621) and the Montgomery (0114 272 0142). Out of the city you will find the Barnsley Civic Theatre (01226 206757), Doncaster Civic Theatre (01302 342349) and Rotherham Civic (01709 823640). Sheffield and surrounding towns all have cinemas in various locations. Sheffield cinemas are at Meadowhall, Crystal Peaks and The Odeon. For dates, times and venues of plays and other events click here for our What's On page. These may be found at the 12,000 seater Sheffield Arena (0114 256 5656) which is one of Europe's leading venues for international artists of high popularity and standing. The Arena has been awarded Live! Venue of the Year for the four years running according to votes cast by persons associated with events which have taken place here during the 90's. Artists who have appeared here include Paul Simon, Prince, Shirley Bassey, Cliff Richard, Tom Jones, Rod Stewart and Barry Manilow. The Arena also has an ice-rink facility where stars such as Torville and Dean and other shows have appeared. Major outdoor concerts are held at the Don Valley Stadium (0114 256 0607) which can hold over 30,000. Here you could have seen the Rolling Stones, Bon Jovi, Michael Jackson, Celine Dion, Tina Turner and others. Other concert venues are the City Hall (0114 273 5295), the Crucible (0114 276 9922), The Leadmill (0114 275 4500) and the theatre halls mentioned above. For dates & times of concerts and other events go to our What's On page. Sheffield and district has a great capacity for night life. Special mention of The Leadmill which is popular with a wide age range. Wednesday's at The Leadmill is 80's Disco night from 10 pm to 2 am, Thursday's is The Beat Club with 60's & 70's music from 9.30 pm to 2 am and Saturday night is live music followed by the Joyrider indie disco - open from 11.30 to 3 am. Fridays have disco's open until 4 am. Many other city centre pubs are bustling with life and music. Barnsley has Club Hedonism (01226 212000), Rotherham has New York New York (01709 720124) and Doncaster has Bacchus (01302 320232) and Karisma (01302 367061). See What's On for further data on Sheffield University and Sheffield Hallam University entertainments.